The Patriots tight end, his father and 2 brothers drop off a $25,000 donation and visit with patients. Patriots tight end Rob Gronkowski posed for photos and met with children at Portland’s Barbara Bush Children’s Hospital on Tuesday. Gronkowski dropped off a donation check for $25,000 with his father and two brothers as part of their family business, Gronk Nation. The money was raised through two raffles by Gronk Nation. One was for tickets to the AFC Championship Game and the other was for tickets to the Super Bowl. 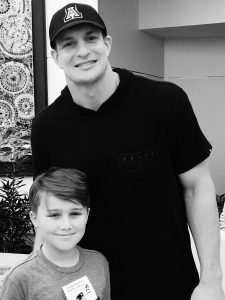 Rob Gronkowski poses with Ryan MacDonald at Barabara Bush Hospital on Tuesday. Photo courtesy of Ryan MacDonald Sr. The hospital was one of three hospitals to get money from Gronk Nation. The others were Hasbro Children’s Hospital in Rhode Island and Boston Children’s Hospital. The money will be used to purchase equipment as well as health and wellness programs. Gronkowski even gave the kids a special treat: He taught them how he spikes a football after touchdowns.